One of the strongest components behind building a reputable web presence is ensuring that everything you put out there—in social media, on your blog, on your website, in your emails—represents your cause in a consistent and unified way. When the voice of your Twitter account sounds nothing like your blog, you’ve got a problem. Your messaging should be recognizable to your dedicated readers across all your platforms. This is why creating a consistent marketing voice is so important. If you’re like many other nonprofits, you might have multiple people—employees, clients, volunteers, guest bloggers—who contribute to writing copy for your organization. You may have one person who writes things one way and another who writes in a completely different way—sending messages in two different voices. One employee may use a more conversational approach in their writing with humorous undertones while another may be more straightforward and formal. But forming a solid online presence that stays true to your brand’s voice is achievable. These five tips can help you create your nonprofit’s voice and ensure it stays consistent no matter who is writing for your organization. Voice: Voice is your brand’s personality described in an adjective. For example, a brand can be confident, professional, witty, or outspoken. Your voice stays consistent and does not change. Tone: Contrary to voice, tone can change. Your tone is reflected in the way you deliver your message. Your brand’s tone will change depending on who you are speaking to or the message you are trying to convey. For example, you may use a humorous tone when writing an email to a coworker but you would use a professional tone when writing a donation ask email to a group of high-level supporters. Tips: Use questions. Be more relatable than authoritative. Use hashtags. Invite others to learn and read more. 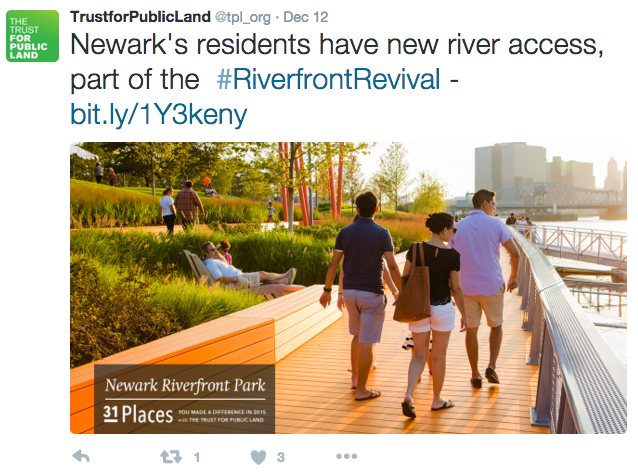 Trust for Public Land’s tweets do a great example of showcasing how their organization has defined their voice and tone for social media. Audience focus is central in the communication process. Understanding what your target audience needs, expects, and most importantly, wants to hear, and then adapting your messages appropriately, improves communication. With that said, when you write for everyone, you write for no one. Rather than trying to write your messages to reach everyone, you should instead focus on trying to reach a target group within your broader audience. One way to narrow your focus and ensure consistency in your voice is to practice writing your messages to an individual rather than a group. Instead of attempting to tackle speaking to a broad audience, writing to an individual will help you hone in on personalization—a key component in getting your recipient to feel as though you truly care about what they are interested in reading. As you write, pretend as though you’re having a one-on-one conversation with an important constituent. This can help keep your messages more personable, engaging, and reflective of your brand. Everyone in your organization, not just your marketing team, should be on the same page when it comes to writing on behalf of your organization. A style guide is a document that guides and informs writing standards across an organization. This document is especially helpful as your organization grows and new staff and volunteers join your team. This central reference should be available organization-wide and easily accessible. Voice: This section should explain the difference between your voice and tone and how the elements of each apply to your nonprofit. Terminology: Many cause sectors have their own terminology they use on a consistent basis. Your style guide should include these terms along with guidelines for how to use them appropriately. Brand Identity: This section determines specifics in terms of design including the logo/s used, color scheme, font guide, and company templates. Content Types: This section should outline the different types of content your organization writes, the main purpose for each type, and who is responsible for writing it. Grammar and Mechanics: Adhering to certain rules of grammar and mechanics helps keep writing clear and consistent. This section lays out your organization’s house style, which applies to all content. Today, many organizations have a team of people responsible for creating content. At your organization, you might have your marketing team write content for your blog but your development team also periodically contributes to your content. This is where the need for an editor comes into play to ensure consistency and provide feedback. Gives Fresh Perspective: You’ve spent hours, or perhaps even days crafting your message. Whether you’ve written a press release or crafted a guide, a fresh pair of eyes can more easily see any overlooked issues. Perfects Your Writing: A professional editor not only fixes mistakes, but helps you perfect your writing. They reveal errors and style issues you may not have noticed to help you improve your work. Provides a Second Opinion: A second set of eyes on your copy could spark a new idea you wouldn’t have thought of on your own. An editor can provide advice and inspiration to further improve your message. It’s the end of a long work day and your boss calls you into a last minute meeting to go over a lengthy report. Your eyes try to stay open but you can feel them weighing down. Similarly, your friend calls you after a long day of work to tell you about her weekend. In both scenarios you are tired, yet you’re drawn to the person who talks more conversationally. This same principle applies to marketing communications. Donors are deterred by marketing buzzwords and strong asks. Instead, a conversational tone is more effective for getting a message across—and getting that message to stick. Make Your Audience Feel at Home: Your target audience should feel as though they are engaging in a conversation with their friend rather than a business anytime they read your content. Use Digestible Sentences: Reading requires work, so your sentences should be as easy to read as possible. Thirty five words or less usually works best. While a mix of shorter and longer sentences is healthy, break longer sentences up by using ellipses, commas, and semicolons to clearly separate your ideas and increase scannability. Use Common Words: Avoid using complex terms and loaded jargon (unless your audience will benefit from this). Instead, focus on common words and expressions used in everyday conversation. Write in an Active Voice: Writing in an active voice helps make your message clear and concise for your readers. Here are example sentences that show the differences between passive and active voice. Passive Voice: The blog post was read by her in four minutes. Active Voice: She read the blog post in four minutes. Provide Responses: Respond to inquiries, comments, and requests quickly and keep it friendly. This helps both small and large nonprofit organizations stand out. 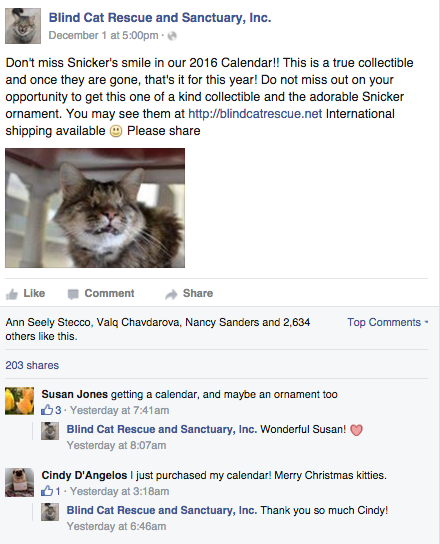 An example of an organization that does this effectively is the Blind Cat Rescue. The example above illustrates a small business successfully building their social media presence and their tone. Blind Cat Rescue and Sanctuary, Inc. uses a conversational, friendly voice, acknowledging commenters by name and thanking them. Finding your nonprofit voice can help you create consistency across your brand. The stronger your voice, the more people will be open to hearing what your organization has to say. And your organization undoubtedly deserves to be heard. How have you worked on crafting your organization’s voice? Please comment below!